The danger of missing a tooth in your smile can lead to serious oral health issues. For example, a gap in your smile due to a missing tooth can cause a receding gum line, the tilting of adjacent teeth into the gap, and shrinking away of your jaw bone from your teeth (resorption). The ideal way to take care of a missing tooth is prevention, seeing your dentist in Malta as soon as possible to remedy the issue and keep your mouth healthy. Not only will a dental implant restore your smile, but you’ll be one of the responsible 500,000 patients annually that replace missing teeth. You do not have to go without missing teeth and feel bad about smiling. You can regain your confidence to smile and show your joy to the world. Know that you’re not alone in this journey. You may feel embarrassed or ashamed of your smile. You have a dental team at Salvatore Dental awaiting your call. Let’s get your smile restored so you can feel excited to smile more! Before a dental implant is placed, your mouth and jaw must have an x-ray. Typically, x-rays are 2D, so only one plane of view is available to determine and diagnose the next best step in your oral health. 3D x-ray technology allows for your dentist in Malta to see your jaw, teeth, and mouth from all angles, which makes diagnosing your implant potential much easier. What’s more, your Malta dentist is focused on your safety, and they have purchased a 3D x-ray machine with the lowest radiation exposure on the market. Once your dentist says you’re ready for your implant, they will utilize 3D x-ray and computer software to virtually place your dental implant before they work on you. This means that they can discover the most ideal placement, as well as use the 3D printer to create the absolutely perfect implant for you and your needs. This virtually planned surgery makes for much higher success rates, more accurate implants, and faster procedures than compared to other dentists. Once the 3D printed guides from your virtual surgery are created, the process of placing your dental implants can begin. This guide is what makes the placement of your implants custom to you and your mouth. Finally, utilizing 3D dental technology allows for you to save money and time, keeping your procedure in-house with your Malta dentist. You don’t need to be referred to another professional to have any piece of your dental implant placed or fitted. We take care of it all for you. The process is smoother and much more accessible to those who need to replace a missing tooth compared to other offices in the area. 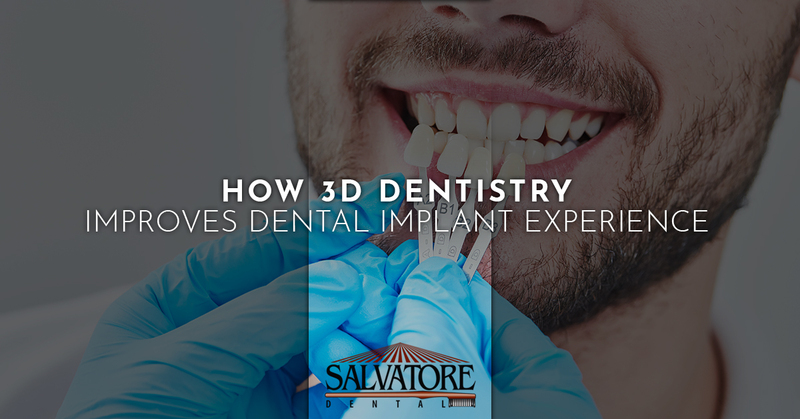 Did you know that Salvatore Dental is the only practice in the Capital District to offer in-house 3D dental technology? Contact our dental office today and get your dental implant consult scheduled so that you can replace your missing tooth and join the hundreds-of-thousands restoring their smiles across the nation.